The story focuses on a dinner with my lovely girlfriend. We rode to Portsmouth NH for a childhood cancer lifeline benefit. 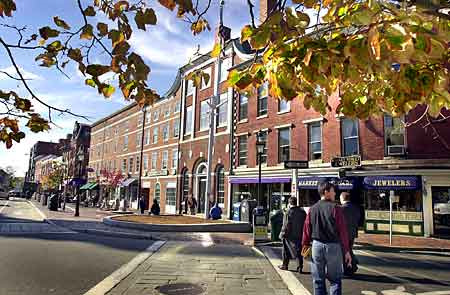 If you've never been, Portsmouth is a lovely port town in New Hampshire that is full of history and charm. As we drove in I began seeing signs for rental properties and as we wandered the city, I saw ads in windows of real estate companies for rental properties nearby. How hard have they made their marketing job I thought to myself. Companies need to market to people who have never been, not limit the field to those who need to come again! Think of the last amusement park you went to, how often did you ride each ride? My guess is not more than once for the largest majority. So why do vacation rental managers market in the towns they rent in? The amount of people who visit a destination once is substantially larger than those who visit again, yet too many professional management companies put the majority of their efforts in local mediums. The reason is, its safe. They have been doing it for years, your vacation rental software doesn't help you branch out, and you know it works to an extent. But without changing anything, you have no way to realize just how small that extent is. Change is the ultimate indicator and too many companies are stagnant. So to put this to test, I picked somewhere I want to vacation, Hawaii, and Googled "Vacation in Hawaii". To the right are the results and the bottom line is, I don’t see one professionally managed Rental Company on the screen. 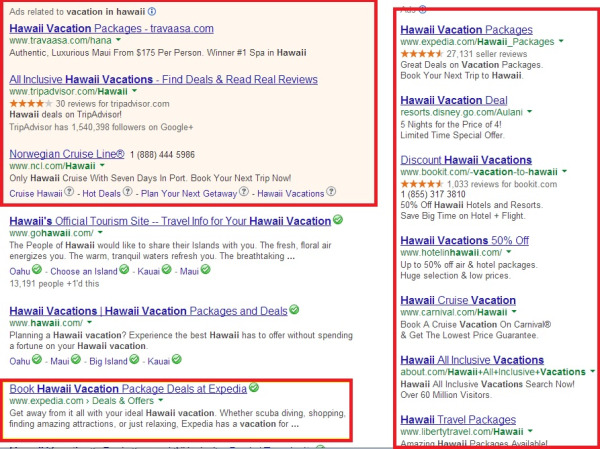 The red boxes highlight competition, like hotels or travel agencies, while the non boxed listings are tourism boards or other non-competition. Now think of your market and the biggest players there, consider your hotel competition and how they market. It may seem overwhelming but with the right vacation rental software and the proper mentality your business can reach more markets than ever before, the only requirement is the mentality to change!